Wondering what to do with a whole chicken? This Garlic Herb Oven Roasted Whole Chicken will make your mouth water. It’s one of my favorite recipes to make in the oven! Whole chickens are a classic, wholesome, home-cooked meal. If you’ve never cooked a whole chicken, it can seem a bit intimidating. It’s easy though! 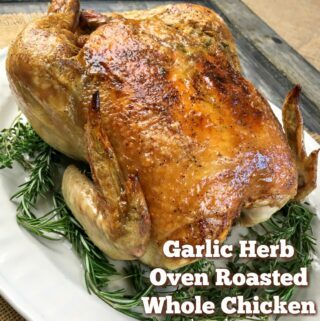 This flavorful garlic herb oven roasted chicken recipe is always a huge hit. It’s the ideal choice for a lovely weekend dinner with family and close friends. As an added bonus, you can use the leftover bones and other pieces to make yummy homemade chicken stock or instead chop up the leftover chicken to add to in a quick salad, soup or crustless quiche for lunch the following day. Some people have asked why it’s necessary to add an onion to the pot since it adds carbs to the recipe. The onion in this whole chicken recipe serves two primary purposes. First, it keeps the chicken up out of the cooking juices so it doesn’t fall apart too much and it adds a wonderful flavor to the chicken and sauce. Second, after cooking, you’re going to discard the onion anyhow rather than eating it, so it won’t have an adverse impact on your carb counts for the day. If you would prefer to completely omit the onion from the recipe, you can use oven-proof metal cookie cutters to keep the chicken out of the juices while it cooks instead of the onion. A great side dish to serve with this roasted whole chicken recipe is oven roasted cauliflower since you’ll be using the oven anyhow. Want to know where to get the best quality meat? We recommend ButcherBox. 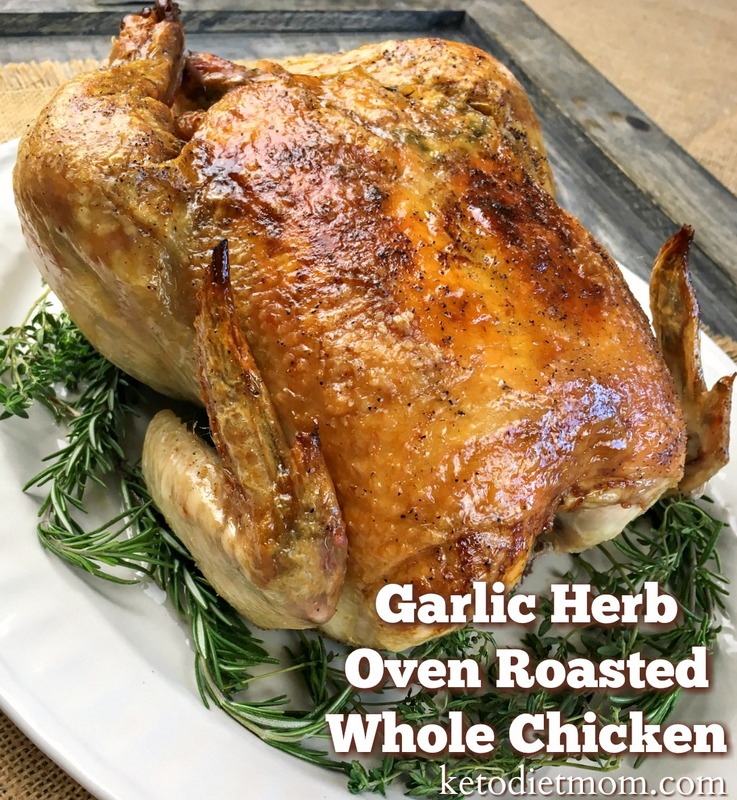 If you want to learn how to cook a whole chicken from scratch, this Garlic Herb Oven Roasted Whole Chicken recipe is great for beginners. Preheat your oven to 425° F and arrange the onion pieces around the bottom of a large, heavy-duty 12” cast iron skillet with high sides. Be sure to remove the neck and giblets from the chicken cavity and discard them. Place the chicken breast-side up directly on top of the onion slices you spread in the skillet. Pat the chicken skin dry with paper towels then generously season the chicken with sea salt and black pepper. Take 1/3 of the fresh herb bundle. Remove and discard the tough stems from the rosemary and thyme leaves. Add those leaves to the sage and then roughly chop the herbs. Add the softened butter, half of the minced garlic and the chopped herbs to a small mixing bowl and stir until well combined. Divide the resulting herb butter into small balls and then place them evenly under the chicken skin that covers the breast meat. Massage the rest of the minced garlic into the inside of the cavity of the bird, then stuff the cavity with the remaining 2/3 of the fresh herb bundle. Secure the chicken legs together with some kitchen string, then pour the chicken broth into the cast iron skillet. Place the cast iron skillet into the pre-heated oven and roast it for 90 minutes or until a meat thermometer inserted into the thickest part of the thigh reads 165° F.
Be sure to check the chicken every 30 minutes while its cooking so you can make sure the skin isn’t getting too browned. If it's getting too brown too quickly, cover the chicken with aluminum foil after 60 minutes and check to see if its done in another 15 minutes, repeating until its done. 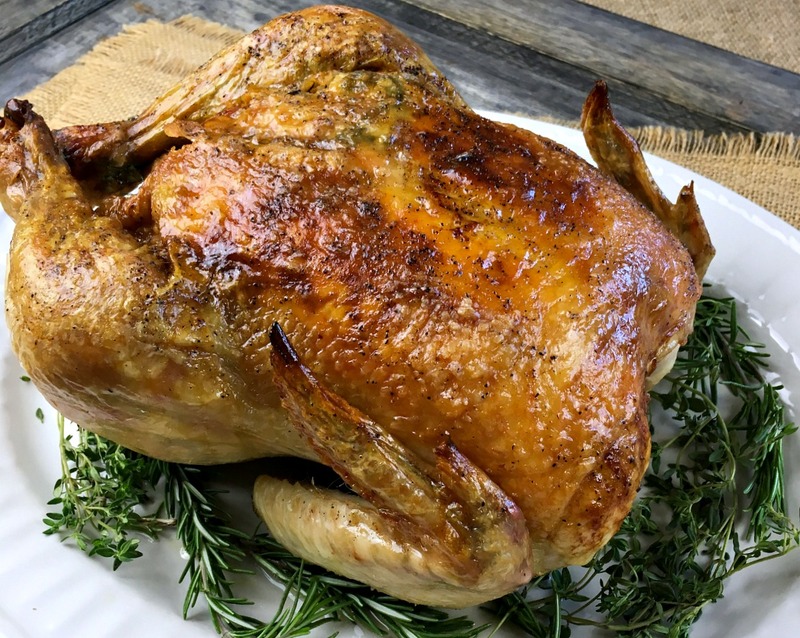 Remove the cast iron skillet from the oven and very carefully transfer the roast chicken to a wood cutting board or durable serving platter. Cover the whole chicken loosely with aluminum foil to keep it nice and warm and allow it to rest for 15-20 minutes. While the chicken is resting, strain out and throw away or compost the onion slices from the skillet, then heat the liquid over medium-high heat. Scrape the bottom of the cast iron skillet with a metal spatula or strong wooden spoon to remove the browned bits. Simmer until the liquid is reduced by half. When its reduced, taste then sprinkle with sea salt and fresh ground black pepper, if you'd like. To serve, carve the chicken and top each piece with a spoonful of the warm pan sauce. It's also great over mashed cauliflower.